There is sufficient evidence that indicates the adverse health impacts of genetically engineered food and its associated input, glyphosate, which a major World Health Organization report states is “probably carcinogenic to humans.” The majority of GM crops are modified to withstand unlimited doses of glyphosate. 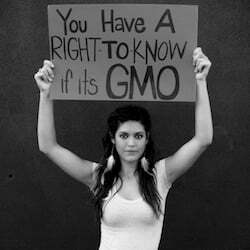 The main GM crops – corn, canola, soy and sugar beets – end up in 70 per cent of processed foods in North America. Despite this, in a 2015 meeting with two senior officials from Health Canada, Parent was informed that the agency does not carry out its own safety studies on GMOs: it merely reviews the data given to it by the industry and approves GM foods based on non-peer-reviewed industry-submitted information. One of the officials stated, “It’s up to them [the industry] to demonstrate the safety.” She was told that because some of the data is proprietary data, Health Canada is not going to divulge information to anyone else to test the product.